Humans have been locked beneath the ocean, punished by the gods for their violence and hubris. A single deity took pity on them and hid the keys to their prison at the end of a perilous journey, which for most, spells certain death. Your goal is to find this mysterious gift and lead humanity into a new era. There are many things you may expect in a game that hails itself as an exploration game. An expansive or procedurally generated map, and a variety of weird creatures or unique characters, for examples. A branching storyline where different choices lead to different outcomes could fit in the category, too. What you want most, though, is the ability to explore the environment at your leisure. By these criteria, Diluvion doesn’t deliver much as an exploration game. Not to say exploration isn’t possible. It is. The world of Diluvion is strange and beautiful, but unfortunately, venturing into the wild is accompanied by a ticking clock. Your air is running out. Your food is running out. The pressure to get to the next port drives you forward, making it impossible to sit and admire the scenery or observe the wildlife. 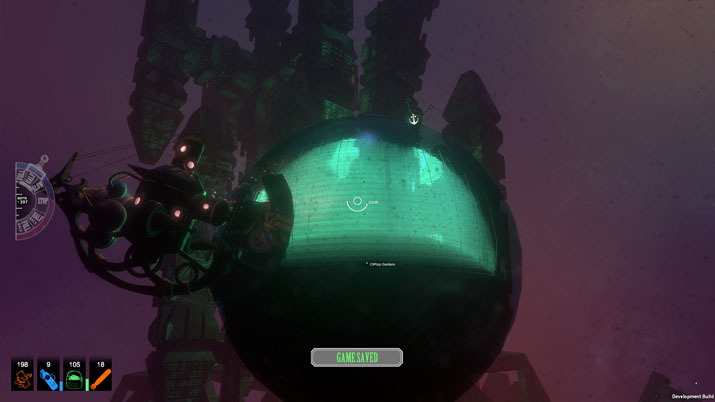 Much of the gameplay around Diluvion centers around resource management. Food and air are the primary resources, but as captain of an underwater exploration vessel, you also have a crew at your disposal. Putting a crewman to assist the helm will give you engine bonuses, but in battle, it may be more important to shift that crewman to the gunner’s station. Crewmen can help search derelict ships, but you risk losing him at every attempt. It’s not just the crew at risk; you are too. Abandoned ships attract scavengers like hot carrion. You have to stop because you need air and materials, but stopping exposes you to the risk of encountering pirates eager for your sweet, collected booty. It’s almost impossible to escape battle unscathed, necessitating ship repairs. This eats into your precious supplies and also requires pulling a crewman from a station to complete the work. You will want to keep the ship in shape, though, and not only because a leaky ship will send you on a one-way trip to Davy Jones’ Locker. When resources are low or your vessel’s damage is, critical alarms sound. Continuously. The noise is jarring and detracts from one of the game’s best features: its music. Diluvion possesses a cinema-quality soundtrack that compliments its ethereal dream-like landscapes. Various settings have different soundwaves, each with its own unique allure. 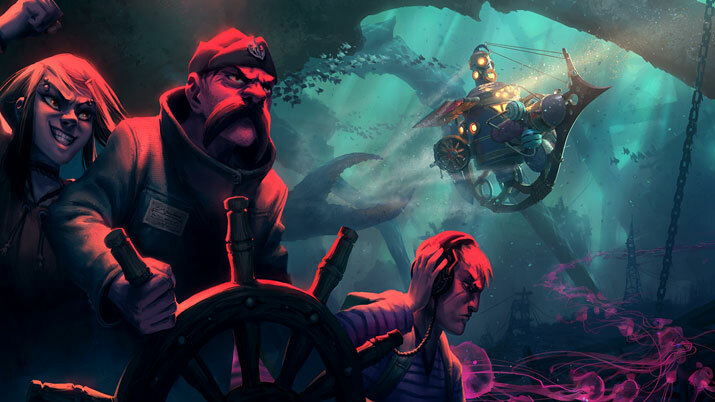 It’s as easy to relax or meditate to Diluvion’s ambient tracks, as it is easy to be energized by the music accompanying its combat. All are superbly scored. The art in Diluvion exists in an unusual dichotomy between a lifelike 3D ocean world, and a flat, hand-drawn cartoonish environment for all interactions that take place inside a vessel. I love both. The seascape immerses you into an otherworldly fantasy while the inside art is charmingly offbeat. However, I am not sure the two work well together. I wouldn’t protest the 2D interiors if the artwork matched the outside environment more, but it doesn’t. It’s as though two separate games were mashed together with little to no consideration for each other’s style. 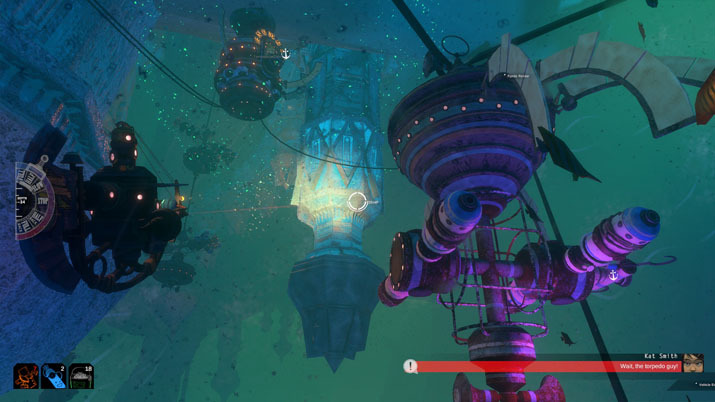 The 2D world also drags down the exploratory nature of Diluvion. Most of the characters do not have unique visuals and the cities are filled with copy-paste cutouts of the same NPCs. The same applies to the derelict ships you explore. After the first few, they all look alike. The lack of variety in game design is detrimental, especially if, like me, you tend to get lost. There is a compass in the game, though, but it's still easy to get turned around. When every ship or station you encounter looks just like three you’ve already visited, it makes it harder to build a mental map of your surroundings. The controls take a little time to acclimate to, but it is one of the few underwater games I’ve played where using a keyboard for movement doesn’t feel like a huge handicap. Although it may be easier with a gamepad, it is perfectly playable with a keyboard and mouse. The game also allows for control remapping for both keyboard and gamepad, a feature that enhances its usability. While playing, I encountered a bug multiple times that I am not sure how to replicate. Because the game is linear, you must complete certain objectives before moving into a new area. In two separate instances, I didn’t execute a series of events in the right order and ended up stuck, unable to move forward or trigger the action that would open up the next section. Both times I had to start a new game to get past the blockage. This bug may be exclusive to the “trench” or starting area, but it was frustrating to encounter. What I would like most in Diluvion is a full “exploration” mode where air and food are taken out of the equation. Some of us prefer the challenge of perpetual character management while completing quests, but the slow-paced, multi-dimensional aspect of Diluvion’s environment would work with a more leisurely pressure-free approach as well. Additionally, some randomization regarding ship interiors would help keep the exploration aspect from being too “samey.” There’s no thrill to exploration if there’s nothing new to see. Although it isn’t an exploration game per se Diluvion remains full of wonders, as long as you remember nothing is instantaneous underwater. Movement will be clumsy but graceful, and each vista carries either riches or treacherous death. The unknown beckons. Diluvion tugs at the soul of the land-bound adventurer that longs to experience the mysteries of the deep. It ties together RPG elements, resource management, combat, and the salty appeal of a marine environment in a brilliant blend of whimsical and exciting.